Product #21353 | SKU H-X025E | 0.0 (no ratings yet) Thanks for your rating! 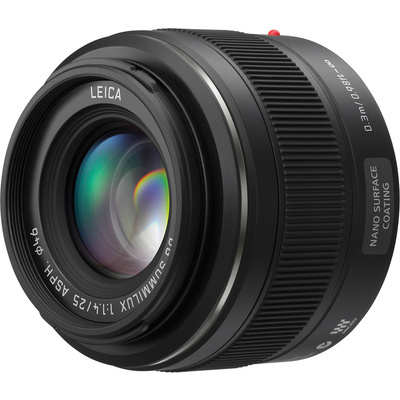 A bright, normal-length lens, the Leica DG Summilux 25mm f/1.4 ASPH. from Panasonic is a 50mm equivalent prime for Micro Four Thirds mirrorless cameras. Characterised by its fast f/1.4 maximum aperture, this lens affords notable control over depth of field and is also well-suited to working in low-light conditions. Its optical design incorporates one UHR element and a pair of aspherical elements to reduce spherical aberrations and distortion, and a Nano Surface Coating has also been applied to suppress lens flare and ghosting for greater contrast in harsh lighting. Additionally, a rounded seven-blade diaphragm contributes to a pleasing bokeh quality. A Nano Surface Coating has been applied to individual elements to noticeably reduce lens flare and ghosting for greater contrast and colour fidelity when working in strong lighting conditions.